Capping what has been an abysmal year for the global automobile market and starting off what Morgan Stanley predicts to be another coming awful year for the industry, Ford reported that its sales for December were down 9%. 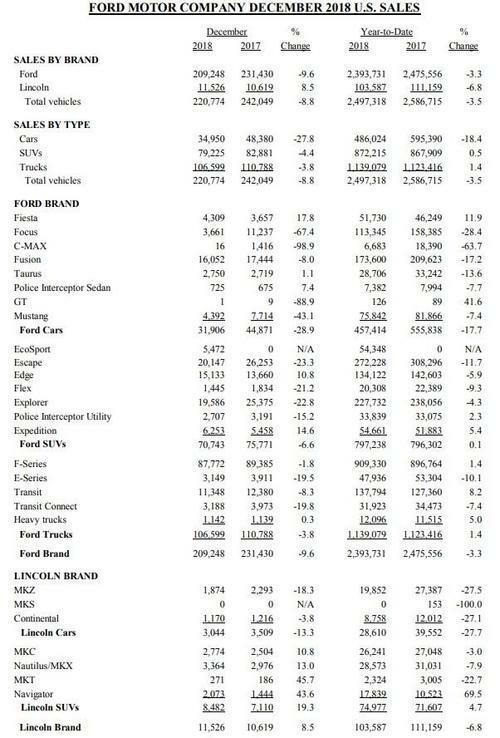 Ford's fleet sales and car sales both cratered, falling well into the double digits, or -19.5% and -27.8%, respectively. And it looks as though Tim Cook isn’t the only one not especially excited about giving up on transparency heading into the back end of a decade-long artificial bull market. Taking a page out of General Motors' book, Ford announced that they were no longer going to report monthly sales data and will be moving to reporting sales data on a quarterly basis instead. As a reminder, when General Motors changed its reporting of sales, it hilariously stated that reducing its disclosures would "give a more accurate view of its business operations". "Thirty days is not enough time to separate real sales trends from short-term fluctuations in a very dynamic, highly competitive market," Kurt McNeil, GM's U.S. VP of sales operations, said at the time. As far as silver linings, there were two small ones: the company actually beat estimates of sales falling 10% which were forecast by Edmunds. In addition, the company sold more than 900,000 F series trucks. As a reminder, Morgan Stanley weighed in this morning with a decidedly cautious outlook on the industry for 2019. The bank expects margins lower for all three Detroit automakers, despite the consensus expecting them to rise between 26 and 61 basis points. Adam Jonas - formerly one of the biggest Tesla cheerleaders - predicts that global auto sales will be down 0.3% year over year in 2019 and that many consensus estimates across the industry are far too optimistic. In a note released Thursday morning, Jonas predicts "lower guidance" coming out of Detroit automakers at the same time that the global auto market sees its first volume drop since 2009. Morgan Stanley also believes that the Detroit Auto Show is going to be where management teams take the opportunity to guide lower. The show starts on January 14.